Aha! Thank you for posting that. And look there's even a Diogee cosplayer. How about that, huh? I was at the Q and A panel....and yes, I was the dork that asked his Hogwarts house (GRYFFINDOR). I met him the day before, and it was awesome but brief. I jabbered his ear off about how he affected my life and how I got into his stuff and how "One More Minute" helped me deal with a crappy ex crush. My bestie was there and said "any idol of Kelly's is an idol of mine." No, the pic isn't glitched, I just covered my friend and parents' faces to respect their privacy. And I'm cosplaying as Vanellope von Schweetz (the next day I wasn't in cosplay). 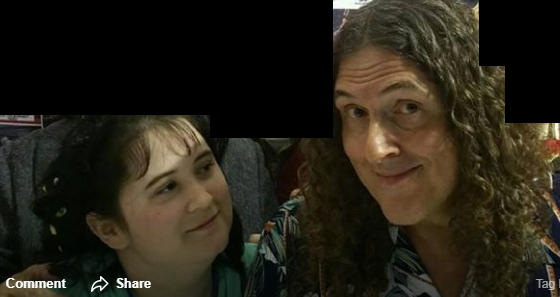 This pic of me and Al (cropped) was used for our Christmas card in 2017!